Ants are critical to the environment in too many ways to count, but they quickly become pests when they invade your home seeking food, shelter, or both. Nobody wants an ant invasion, and so often we will reach for intense chemicals to eradicate them as quickly as possible. Pest control is one aspect of daily living in which people accept some of the scariest chemicals into their homes, numb to warnings stamped on the packaging-“Don’t inhale!” “Don’t touch!” “Call poison control if you make any direct contact with this substance!” “Potentially harmful!” “Actually what we mean is it will kill you!” Well, you get the point. If something needs detailed instructions plus a hotline number for 24 hour emergency assistance (human or animal) or chemical emergency assistance, I don’t want it in my house. What you have to think is-if this is going to obliterate the pests (in this case, ants) won’t it be harmful to anyone and everything else? Yes. It will. But what nature brought forth is can also turn away, so read on about how to get rid of ants naturally. 1. Bust out the vinegar. Mix together white vinegar and water, and spray/wipe down all of the entrances you know or suspect they may be getting in by, and spray/wipe down all counters or surfaces by food sources. Draw a thick, heavy line around entrances-repeat as needed. This generally needs to be used in conjunction with another method of elimination. 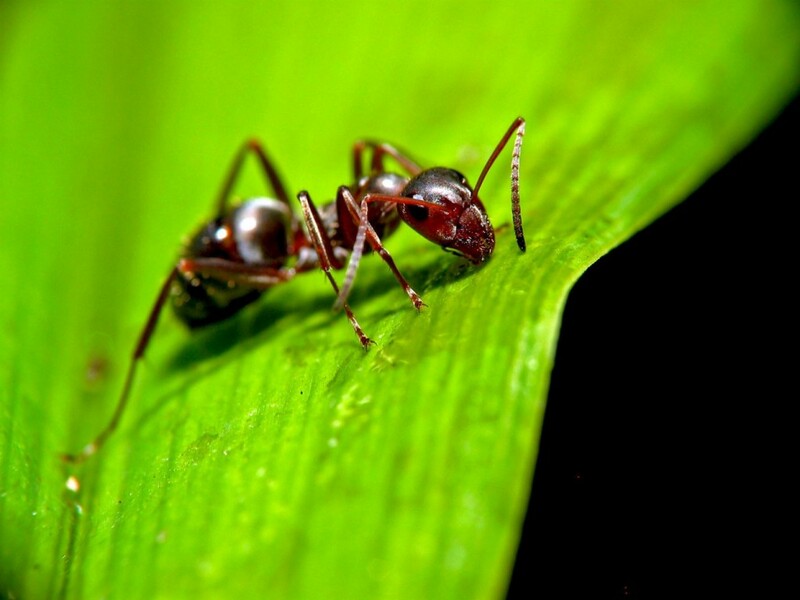 How to get rid of ants…are you focusing too much on the “get rid of” part? Have you done everything you can to exterminate the ants, but it’s just not working? If eliminating them isn’t doing the trick, try diversion. No, you don’t want to attract the ants to your house, but if a colony has set up camp, diversion can sometimes be the way to go. Once they’ve decided the honey pot you lay out is better than that hard to reach food you’ve locked up, it’s easier to lay something to deter them from coming back in. After you’ve got their scent trails cleaned up, food sealed tightly, and some kind of deterrent by the entrances, they aren’t nearly as apt to coming marching in again. Even if they try, they’re going to find you’ve made it a lot harder by then! Place a little paper bowl with the honey outside, a little ways from your house but not so far that the ants won’t find it. Once they find the sweet stuff, they will happily go to that, rather than try to battle their way into your house. You can also mix some sugar and water and spray it on the ground if you find the honey ineffective. Once they have discovered the pot, move it a little bit at a time further and further away from the house, refilling and refreshing it as needed. Ants don’t like strong smells. They mess up their scent trails and communication, not to mention it covers their bodies if they literally have to crawl right through it-which they do, with this essential oil spray. Now you can really experiment with different oils, or blends of oils, and see what works best for you and your ants. For me, peppermint or eucalyptus usually does the trick. Regardless of what method I am using to get rid of ants, I always whip up a batch of this spray to further ensure success. If you find that spraying a solution of essential oil and water doesn’t work, it’s time to bust out the ant balls. The cotton balls serve as an extra barrier to keep the ants out of the home, while the undiluted essential oil will steer the ants clear at least 90% of the time. Be sure not to leave these where you think a curious pet or child would find them an appealing snack. If you don’t have essential oil, you can try using white vinegar in a pinch. Liberally douse the cotton balls with undiluted peppermint essential oil. I usually put the oil in a dish first so I don’t accidently drip it all over my fingers. Alternatively, soak the ball in undiluted white vinegar, squeezing out just enough excess that it doesn’t leave a puddle where you place it. Use one of the cotton balls to wipe down the area by the entrance, and then stuff another into the crack/hole/almost invisible opening that they are sneaking in through. Refresh as needed. I don’t like to kill anything-I am the person that will rescue an ant if I see it floundering about in the water-but sometimes, you have no choice. For example, if you have a nest of fire ants and a baby crawling around-there was even been an instance where the venomous stings of a fire ant colony almost killed a 13 year old boy. In this case, the non-toxic way to eradicate the ants is with soap and boiling water. It’s unfortunate, but sometimes there are simply other things you need to protect. Tips: Ants seek two primary things in your home-food, and shelter. The first step in dealing with getting rid of ants is to seal up any and all food, and seal up any and all crevices that you find them making their way in through. I know-its more work than just spraying some insecticide around-but it’s worth it. – Let me re-emphasize the part about sealing up food. Seal up your food! This entry was posted in Eco awareness, Eco Tips, Uncategorized and tagged ants, natural pest control. Bookmark the permalink.